Last Friday, I received a note from Philip’s kindergarten teacher saying that Philip still needed some help identifying words that belong to the same rhyming family group, for example bat, cat, and mat. Despite having tried almost 1,000 different educational apps over the past three years, I can’t recall a good app that could help Philip learn about word rhymes. So, I created my own version of a word rhyming game using Post-It Notes. I wrote consonants, such as "b", "ch", and "f", and rhymes, such as "-ar", "-at", and "-in", on Post-It Notes. Then, I asked Philip to combine them to build words and learn how to pronounce them. I even added a few Post-It Notes that contain sight words that have the same rhyme as the words he’s working on, such as "star", "flat", and "skin". As luck would have it, during the weekend I stumbled upon this great app from PBS Kids: SUPER WHY Phonics Fair. This relatively brand new app offers a great solution to Philip’s needs. It even has a couple of mini games that match what I was doing manually. The first game that matches exactly what Philip’s teacher was referring is Alpha Pig’s Whack-a-Word. In this whack-a-mole game, juniors are asked to tap on the words that match the current rhyme family. For example, the "-ot" rhyme family may include words such as dot and knot. The second game that matches my manual approach is Super WHY’s Bumper Words. In this game, juniors are asked to bump two cars that will form a particular word. For example, bumping "b-" and "-oy" cars will form the word "boy". There are three other mini games included in this app, each designed with a carnival theme in mind. Each time players complete the challenge in these games, they earn a ticket which they can trade for various prizes. The third game is called Wonder Red’s Wonder Words Ball Toss. In this game, players are asked to shoot the basketball into one of the three hoops. They need to match the word on the ball against the pictures on the hoops. The next game is called Princess Presto’s Spectacular Spinning Wheel. Juniors are asked to identify the text whose phonics match the sound that they hear. After combining it with the family rhyme, they can spin the wheel to see the word they just built appear. The last game is called Woofster’s Woof-de-Word Coaster. Juniors go on a roller coaster ride with a cart that has the ending rhyme. As they ride, they will find phonics that they can attach to the rhyme to make up a word. The games in SUPER WHY Phonics Fair are designed for juniors ages 3+. Each of them has the option to play with uppercase letters or lowercase letters. 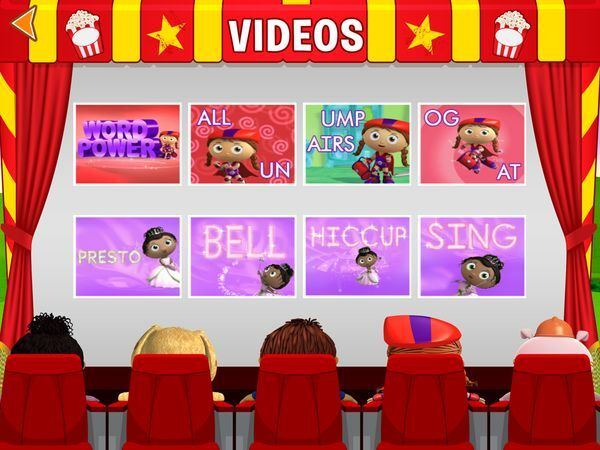 The app includes eight SUPER WHY music videos that highlight spelling and phonics even more. It also has a progress tracker for parents to track how well their juniors are performing. SUPER WHY Phonics Fair is a free app with in-app purchase. It comes with a pack of 30 rhyme families. A special Advanced Level, which consists of another set of 30 rhyme families (such as "-ake" and "-ook"), is available as an in-app purchase. Honestly speaking, I tend to steer away from free and free-with-IAP apps, especially when they’re targeted at juniors. But, I believe this app has find a sweet spot for a free-with-IAP educational app for kids. There are several reasons for this. First, the app is fully functional without having any locked features. Thirty rhyme families are more than enough for anyone to "try" the app. In fact, I’d argue that the 30 rhyme families should be enough to make it a paid app. It’s like someone sold you half of his great product for free, and you’d only need to pay if you want the other half too. Second, it reaches out to many people who would not even "try" the app unless it’s free. Now, it effectively reaches at least twice the number of people than if it’s a paid app. And because the people who want to pay for it would eventually buy the in-app purchase, the app may end up with much more revenue than it would otherwise. One final thing that I like about this app is how well the mini games are designed. They’re creative, fun, and fit nicely with the carnival theme and its intended audience. I’m forever grateful that it also matches nicely with Philip’s current needs and his kindergarten curriculum. SUPER WHY Phonics Fair is a must-have app for juniors ages 3+ who are learning about phonics, rhyming words, word building, and early-stage reading. The games are well-designed to fit the theme and suitable for the target age range. Even its pricing strategy is well designed to accommodate parents who want to get a free trial at the games. Highly recommended!